Today, my mother came over and was gardening at my house, which she loves loves loves to do. She considers my lawn simply another place where she can plant more flowers than she knows what to do with. At one point, I was inside laying about, trying not to feel tired and sore (pregnancy, how glamorous you are) when I heard a knock at my front door. Assuming I had mistakenly locked my mom out of my house, I rushed up and opened the door only to see a different postman than normal with a package in his hand as well as all of my mail. I immediately guessed what the package was, and after thanking my nice postman, I ripped into the box from Simply Sock Yarn. 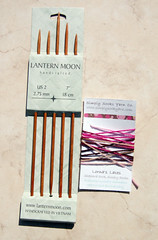 Inside were several goodies, but let's start with the Lantern Moon rosewood needles. I have an obsession with pretty knitting needles. When I first started out knitting, I had a ton of cheap-o metal needles, which are great for learning how to knit, but then I slowly started buying more and more fancy needles, including a ton of bamboo needles as well as several sets of Addi Turbos. (In fact, I refuse to buy any circulars besides Addi Turbos currently due to my horrible luck with circulars that have split at the join.) My ultimate luxury in knitting needle, however, is Lantern Moon's ebony or rosewood needles. If I could knit ONLY with them, I would. I hadn't known until I first hit Simply Sock Yarn's website that they even had tiny DPNs, but when I learnt that, an incredible desire for them formed. I decided to buy them as soon as humanly possible. Of course, after I ordered them, I found that Lantern Moon makes specific sock DPNs which I now desire. 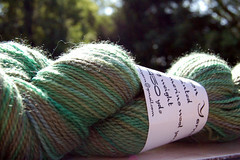 My second purchase was two skeins of Lorna's Laces Semi-solid (or whatever it is) Shepherd Sock yarn. I plan to make my friend (and boss) Helen a pair of knee high socks. If I can find the issue of Interweave which contains these socks, I'll purchase the magazine (since it also contains the Montego Bay Scarf pattern which I've fallen for), otherwise, I'll simply buy the pattern when the time comes to knit this yarn. I highly recommend Lorna's Laces yarn, by the way, if you're like me and you've accidentally felted more than one pair of hand knitted socks in the washer/dryer in the past. I've yet to felt any of the socks I've made with their yarn, and I've made plenty by this point! My last purchase of the day was so gorgeous that I must put the picture in the dead center of this page. It is Sleeping Dragon's sock yarn in Mossy Frog. 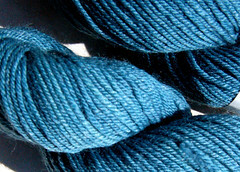 This yarn is 100% wool, which I blanked on when I purchased it, but luckily it is superwash. I don't really like many of the Sleeping Dragon colorways I've found online, but I've been in a 'green' knitting mood lately, probably due to painting and decorating a full nursery in green, so I was enticed into this purchase! If you love to knit socks, I highly recommend that you go visit the Simply Sock Yarn's blog to view their latest contest where you can possibly win some sock yarn! I had to enter, and you know what my favorite sock yarn is. I also recommend simply purchasing from Simply Sock Yarn! Unlike Knitting Garden (grumble, grumble) who held onto my money for MONTHS while I waited for some out-of-stock yarn, Simply Sock Yarn got me my yarn within two or three days. Mmm. Nothing like a quick fix of sock yarn. I wish they sold regular yarn too!